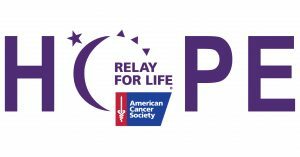 We are incredibly excited to share that our Michigan office is participating in this year’s Relay for Life of Greater Kalamazoo on Saturday, May 19, 2018 in Portage, MI. The event is a fundraiser for the American Cancer Society, an organization that Versant Physics first got involved with in 2017. “It’s important that we join our community and work together as a team to contribute to an organization that is not only close to our hearts, but to each and every one of our jobs here at Versant Physics,” says Managing Director, Marcie Ramsay. We have set a goal we hope to surpass of $1,000 for the American Cancer Society. In order to meet, or maybe even exceed, this amount, we have planned two fundraising initiatives of our own: Strike Out Cancer and Brews for a Cause. 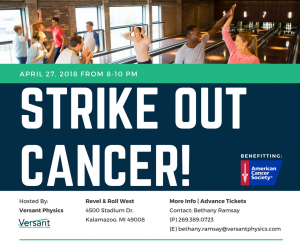 Strike Out Cancer will be an evening of bowling and fun hosted by Versant Physics on Friday, April 27th at Revel & Roll West, located at 4500 Stadium Drive in Kalamazoo, MI. Tickets are $25 each and can be purchased the night of the event, or in advance by visiting the Versant Physics office, located at 116 S. Riverview Dr. in Kalamazoo, MI. Next up is Brews for a Cause on Saturday, May 12th. We’re excited to provide an opportunity that not only helps our fundraising efforts for the American Cancer Society, but allows our team to enjoy some of Kalamazoo’s famous craft beer culture. Tickets will be $25 each and will include entry into all participating venues, your official 2018 Brews for a Cause t-shirt, transportation courtesy of our volunteer designated drivers, as well as discounts and prizes! Additional details to come. The grand finale is Relay for Life on Saturday, May 19th at the Kingdom Outdoor Center, located at 8151 Merchant Plaza in Portage, MI. The event kicks off at 10:00 AM and provides a variety of activities all day long until 8:00 PM. During the event, team members will take turns walking around the designated path. At least one member of the Versant Physics team will be on the track at all times, signifying that cancer never sleeps. We will have a campsite set up during Relay for Life where our fundraising efforts will continue. 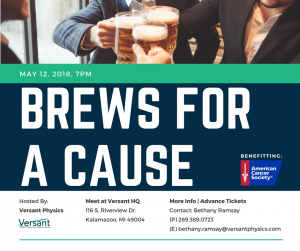 The entire Versant Physics team has been working hard preparing for these events and we’re all grateful to be a part of the American Cancer Society. We can’t wait to see you there! 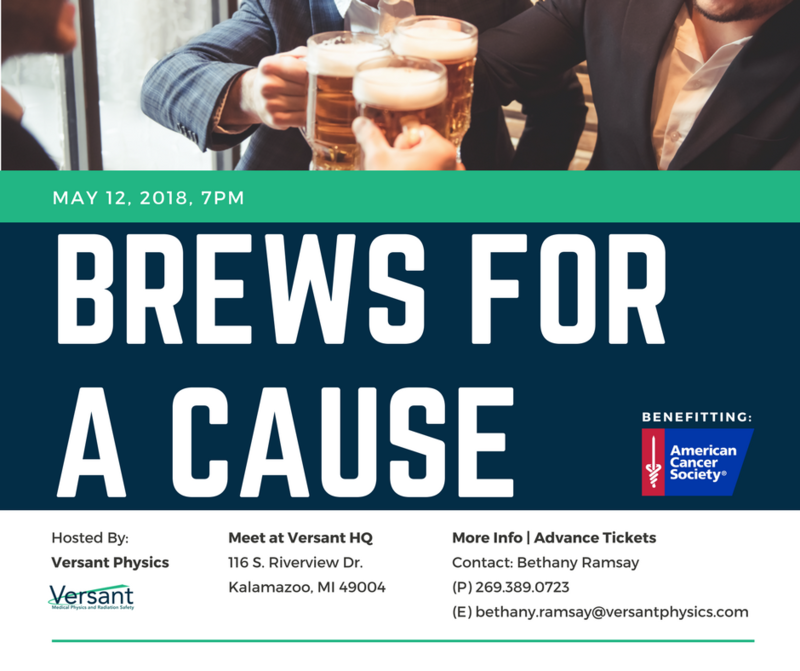 For more information, to walk with the Versant Physics team, or to make a donation, contact our Marketing Coordinator, Bethany Ramsay, at 269-389-0723 or via email at bethany.ramsay@versantphysics.com.